The Spirocore lower viola C,G and Larsen A and D are a classic viola string combinations used prevalently around the world. The Tungsten C Viola Spirocore will give you a big, punchy response and the Silver G, similarly. The Larsen A is very responsive which we offer in either loop or ball and all available gauges. 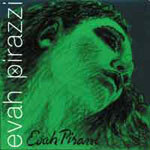 Evah Pirazzi synthetic/composite core and tend to be a little brighter and responsive to Pirastro's Obligato strings. The EP's come in three gauges: Weich (or light), Medium or Heavy. Pirasto Obligato has a synthetic core (that will mimic gut), but without all the hassles of gut. Gold Label, gut string core with that famous E string! 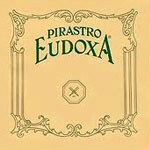 Pirastro's Chorda gut strings are the perfect choice. These are the old-fashioned tied end string that players used 200 years ago. 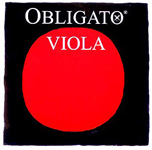 Eudoxa viola, gut core strings, metal wrapped and come in several different gauges to accommodate any violin! Chromcor Viola are metal strings and popular for schools on a budget. 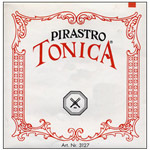 Tonica violin strings with a synthetic core, very responsive strings. 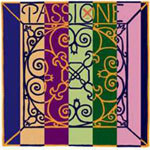 Pirastro's Permanent Viola Strings are steel core and steel wrapping.